What is relapsing-remitting multiple sclerosis? In multiple sclerosis (MS), the central nervous system, which includes the brain and spinal cord, becomes damaged. 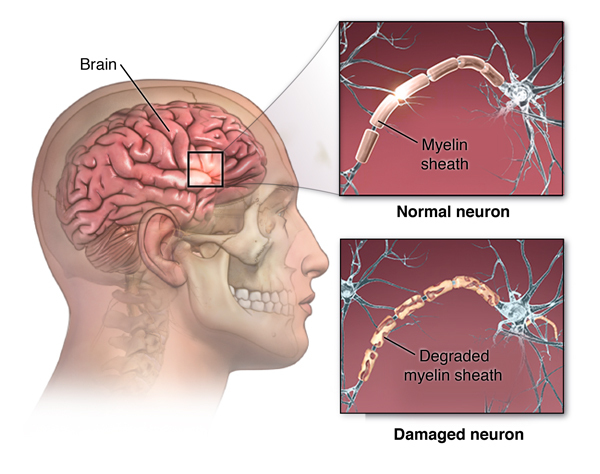 MS causes the immune system to attack the myelin, which is the insulation protecting the nerves. The nerves themselves can also be damaged. When myelin or the nerves become damaged, nerves cannot properly pass along their signals. The damaging process forms scar tissue called sclerosis, which gives the disease its name of multiple sclerosis. Different types of MS affect people in different ways. One type is called relapsing-remitting MS. With this type, you have flare-ups of the disease, or relapses. Between these flare-ups, you have periods of recovery, or remissions. Most people diagnosed with MS start off with the relapsing-remitting type. In most cases, the course of the disease changes after a few decades and is then likely to become steadily worse. MS most often develops in people in their 20s and 30s. Women are twice as likely to have MS as men. Multiple sclerosis occurs when your body’s immune system attacks the central nervous system, damaging the myelin that protects nerve fibers. Experts believe that environmental factors trigger the disease in people whose genetics make them susceptible to MS.
Who is at risk for MS? What are the symptoms of relapsing-remitting MS? Relapsing-remitting MS is marked by relapses that last at least 24 hours. During a relapse, symptoms get worse. A relapse will be followed by a remission. During a remission, symptoms partly or completely go away. How is relapsing-remitting MS diagnosed? Healthcare providers use many tests to help diagnose MS. Your healthcare provider will ask you questions about your symptoms. It's important to rule out other diseases that can cause similar symptoms. Your healthcare provider will also check to see how well your vision, your sense of balance, and other functions are working. You will need an MRI scan of your brain and spine. This may find areas of damage in your brain or spinal cord that suggest you may have MS.
Another possible test measures what’s called visual evoked potentials. Painless electrodes placed on your scalp measure how your brain responds to things you see. Your healthcare provider may want to check your blood for other signs of disease. 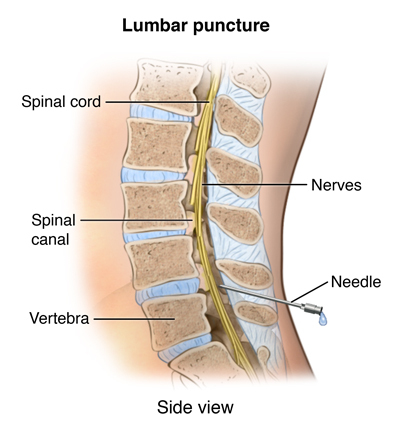 He or she may also order a test called a spinal tap (also called a lumbar puncture) to look at a sample of your spinal fluid. How is relapsing-remitting MS treated? Your healthcare provider may also suggest steroids to reduce symptoms during flare-ups. If steroids are not effective your healthcare provider may recommend plasmapheresis, a blood cleansing procedure. What are the complications of relapsing-remitting MS? In most cases, relapsing-remitting MS is mild, although you may need to use a cane or other mobility device. In some cases, the disease is severe and causes the inability to care for yourself. Seldom does it cause death. If you have relapsing-remitting MS, you can take steps to manage your condition. Physical therapy may help relieve muscle spasms. Eat a diet low in saturated fat and trans-fat. Eat more foods with healthy omega-3 fatty acids because these nutrients are believed to fight inflammation. Talk with a counselor to help with depression. Avoid situations that cause you to become overheated. Get a moderate amount of exercise and enough sleep. Multiple sclerosis affects young people in their 20’s and 30’s. MS affects the way your muscles and eyes work. Although there is no cure, medicines can help you manage your symptoms. Adopting a healthy life-style can also help you manage your disease. Avoiding overheating or other triggers can prevent flares of MS.